Do you know how your dad set up the turkey in the egg? i.e, place setter, pan, etc? Jen, great site with lots of good ideas! Did notice in your version of the Good Eats turkey on the Egg, that you didn’t mention the brine should be rinsed from the turkey after brining. Alton did suggest that on his version, so it is probably important. I usually rinse anything I brine, or it turns out way too salty. This was the best turkey I’ve ever eaten! We cooked it on the egg & added pecan chips…sooo good! Thanks! We used this brine recipe and my dad smoked our Thanksgiving bird on a regular smoker. His smoked turkey is always good but I was hoping to add a little more moister to the white meat with the brine and it worked. The turkey was a huge success and we didn’t wash off the brine. Since we only had immediate family for this Thanksgiving, I decided it was a good time to experiment with the turkey. I’ve been brining for years, and all turkeys have turned out great in the oven, but I wanted to have the oven free for everything else. This recipe was fantastic and actually easier than using the oven. I experimented with different pans and racks to make sure I knew what would fit with the plate setter. My 13 lb turkey fit into a smaller roasting pan and I was able to use a V rack. We got the Egg up to 500, but after opening it only returned to 450, so we started out there, then reduced to 350 after 30 minutes. 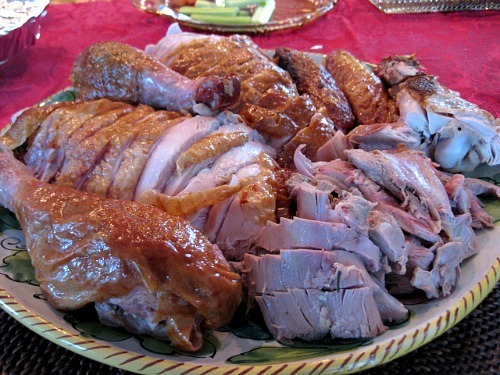 Turkey was done in 2 hours and as moist as can be – beautiful! It rested for at least 30 minutes. Sorry I didn’t take a picture! Only thing I would do different would be to check temp even earlier. Set my BGE up at 350 degrees, set oven for 500, started in oven in a v rack/ roaster pan, then transferred to my egg, setup with plate setter and grid and one lone chunk of Apple wood, roasted till breast registered 158 removed and tented with foil for 45 minutes, breast came up to 166 degrees. Best tip I ever learned and can be utilized with any cooking method is to ice the breast for 25 minutes prior to cooking, this allows the breast and thighs to finish at the same time. Good luck everyone!